On Monday, 18 October, I flew my first solo cross-country flight. The term "cross-country" is a misnomer, and I had to explain to family and a few friends that I was not really going to fly completely across the country (that would be fun, though). 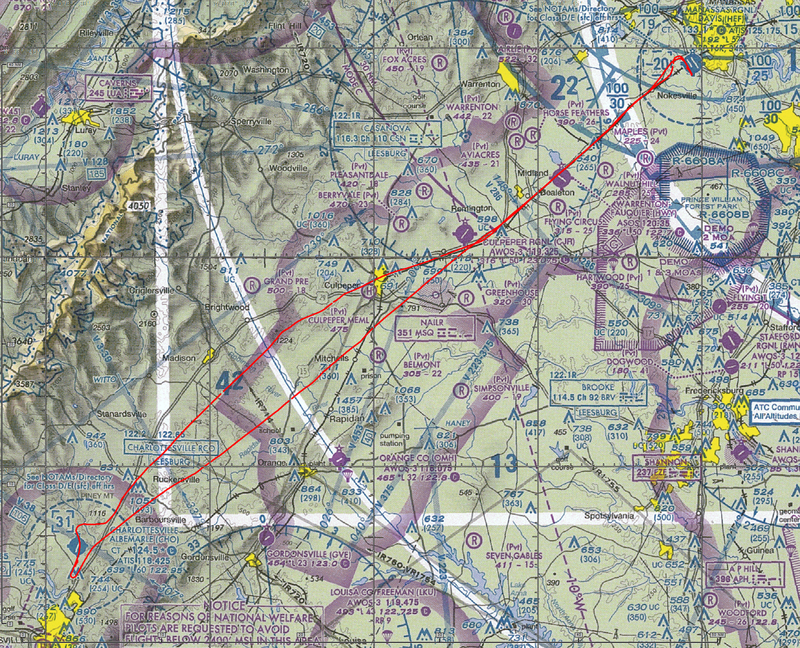 The FAA defines a "cross-country" flight as one where the landing point is at least 50 nautical miles straight-line distance from the departure airport. In my case, Charlottesville-Albemarle Airport (KCHO) fit the bill at 56 nautical miles. This airport's runway is 6000 feet long and 150 feet wide--no wonder they send students there. My CFI signed off on my flight plan and the weather by around 0800 EDT. By the time I had filed my Washington DC SFRA and VFR flight plans, preflighted the blue 1981 Cessna 172P, called for fuel, and completed the run-up, it was almost 9am. I have consistently taken way too much time on the preflight for solos. I asked the lineman to fill the tanks 2" below the collars so that I'd have room for 7 gallons of 100LL at Charlottesville, the minimum for the FBO to waive the ramp fee. 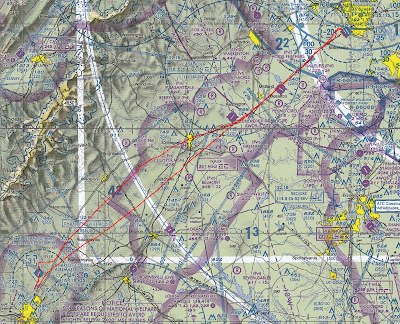 At 0856 EDT, I rolled onto runway 34L at Manassas and the flight to Charlottesville was uneventful. I had no problem getting flight following from Potomac Approach (they are great) and the tower controller gave me a downwind entry for runway 3 with no one in the pattern. I was a little high on final and ended up making a power-off, full-flap landing with touchdown just past the numbers. My landing time put me within 1 minute of the ETE in my flight plan. I taxied to Landmark and this time there was a lineman directing me on the ramp. This was a first for me, and I didn't understand the signals aside from "stop." He explained what he was trying to tell me after I shut the airplane down and then turned the plane 90 degrees by grabbing the propeller and lifting the nose wheel off the ground. Yet another lesson learned by my screwing up. Cool looking Cessna 140 next to me on the ramp. Since I was running behind schedule and I thought someone had scheduled the airplane at 11, it felt like an eternity for them to put gas in the plane. I called Flight Service to close my flight plan, and it turned out that they had opened the wrong one. That was easy to sort out. The woman at the desk was gracious enough to autograph my logbook, which was required to prove that I had been there. Apparently a student at my school had just flown circles in the practice area rather than flying to the destination airport, so proof was necessary. There was a pretty Cessna 140 on the ramp next to me. After paying the bill, I taxied back out to runway 3 and did my run-up in the taxiway since there is no run-up area at that end of the airport. I noticed the engine ran a little bit rough on one of the magnetos, but since it didn't cut out solely on that mag, I decided to press on. I had filed for 3,000 feet on the return trip, but the ground controller told me that I needed to fly 3,500 (not true for VFR altitudes at or below 3,000). After waiting for two aircraft to land, I was cleared to takeoff. I wound up on the wrong side of my first checkpoint and forgot to sync the directional gyro with the compass heading--I won't do that again. When I asked for flight following from Potomac Approach, the controller assigned me a new squawk code. I mentioned that I had been given one on the ground (5xxx), but he said he didn't know what that was and assigned me a code beginning with 0. The original code turned out to be my transponder code for my DC SFRA flight plan. He realized that about 10 minutes later and switched me back. I mistook another hill for the checkpoint at Mitchells hill/tower and flew off course. When I saw the lake near Culpeper, I realized something was wrong and corrected. This error put me off my planned ETE by only 2 minutes.